Ah, Las Vegas! As we were taxiing in from McCarran airport I saw a big neon sign in front of a strip joint just off I-15. In ten-foot-high letters it read: “Veni, Vidi, Veni,” which is about as funny as Vegas gets. However, once we arrived at the Venetian—the site, as it has been for the last decade and a half, of the high-end audio exhibits at CES 2018—the fun stopped. Where in the past you’d find floor after floor of the latest and greatest in the Venetian, at this year’s CES there was exactly one floor (the 29th) of audio exhibits (not all of them high end), with a single, exceptionally good outlier on 35. In my category—speakers above $20k—there were no debuts (unless you count the reintroduction of a fifty-year-old electrostat as a debut). In fact, there were next to no exhibits. Oh, the handwriting’s been on the wall for CES for four or five years now, with audio exhibitors transitioning from what used to be “the show” to consumer audio fairs around the country and, of course, to what has now become “the show” worldwide, Munich High End. This said, in 2018 CES came very close to scraping bottom. I don't know if this year’s gathering spells the end for audio-in-the-desert. (Paradoxically some manufacturers reported doing good business, and that 29th floor certainly seemed crowded, although this might have been an illusion created by the fact that, outside of the one fabulous system on 35, there were no other floors to go to.) But even if high end at CES drags on for a year or two more, it’ll never be what it once was. Which is sad. I have fond memories of the wild and wooly heydays of CES at the Alexis Park and the St. Remo, before CTA moved the show uptown and upscale. No, the Alexis and the Remo weren’t the Venetian—they didn’t even have casinos. But they were frat-house fun; they were open to all; they didn’t cost the exorbitant amounts that the Venetian costs; and they didn’t have the airs that the Venetian puts on—the pretense, found everywhere in Sin City, that Vegas is about class when, in fact, it is almost entirely about “veni, vidi, veni” and taking your money. Anyway, for what it’s worth, here is what I heard at CES 2018. The $76.8k, aluminum-bodied, three-way (one 1" YG BilletDome tweeter, two 6" YG BilletCore mid/woofers, and one 10.25" YG BilletCore woofer) YG Acoustics 2.2 floorstander, driven by Nagra’s statement HD amplifier, HD preamp, and VPS phonostage, sourced by a vintage Nagra reel-to-reel deck, and tethered by Kubala-Sosna cable, sounded truly wonderful—beautiful, majestic, and very full-range (especially with René LaFlamme’s reel-to-reel tapes). I was particularly wowed by René’s tribute to Chet Baker, recorded with Neumann U67s, which had gorgeous timbre and realistic bite on trumpet (though the standup bass was just a little thick and slow on attacks). LaFlamme’s Leonard Cohen recording was also wonderful, with natural presence and texture on LC and the backups, as was a Getz/Gilberto recording from 1974. Technics' $26,999, three-way (four 6.5" low-frequency drivers, one 6.5" flat coaxial mid/treble driver) SB-R1 floorstander sounded just as fabulous as Alan Taffel said it did in his recent TAS review of the complete Technics R1 system. Sourced by Technics’ new statement $20k SL-1000R turntable (with Ortofon cartridge and Lehmann Cube phonostage) and powered by Technics SE-R1 stereo amplifier and SU-R1 network player/preamplifier, the SB-R1 was the most neutral speaker I heard at CES—quick, smooth, and colorlessly transparent on my Debussy Sonata LP, with good body and a robust power range on the piano, excellent attack on the violin, and natural timbre and texture on both instruments. The R1 system might have been a little thin in the very low bass in this room; still, it gave me some of the only goosebumps I experienced at CES, when I was listening to the great Columbia recording of the Shostakovich Second Piano Concerto. I’ve never much cottoned to Wilson Audio’s two-way, stand-mounted Duette, but this year the $22.5k Duette II (one 1" dome tweeter, and one 8" mid/woof), driven (superlatively) by VTL’s S-200 stereo amp and brand-new TP-2.5i phonostage, sourced by a Brinkmann Spyder ’table, and wired with Nordost Odin cable, may not have gotten the cavernous width and depth of Roberto Gerhard’s Libra on Decca Head (the Duette is, by design, parked against the wall), but it showed genuinely lovely timbre on all the instruments in Gerhard’s “memory” piece, had better definition on drum than I heard in the Magico room (see below), good (albeit a little soft and sweetened) transients, very good separation of the instrumental ensemble, and just plain excellent sound overall! The bottom octave of piano on the Decca disc was just a little soft, though there was no bottom-end softness on Ray Kimber’s very hard-hitting Iso-Mike recording of piano, Chopin’s Last Waltz.) Bottom line: This was a wonderful speaker, purpose-built for tight spaces, driven by wonderful electronics. Although I’m not sure it is a real-world product yet, Jon Kerns and George Harris were showing a refashioning of the $25k KLH Model 9 electrostat (one of my all-time favorite loudspeakers). Using original Model 9 mid/bass panels (refurbished by none other than David Janszen), refinished Model 9 frames, and a new electrostatic tweeter (also from Janszen), the KLH ’stats were high among the most lifelike speakers at CES. Driven by a Rogers Sound EHF-100 MkII integrated amplifier and sourced by a plain-Jane Oppo CD player, these reborn classics (once denominated the “most nearly perfect speakers we’ve ever heard” by J. Gordon Holt) simply sounded real on voice—and virtually all acoustic instruments. Apparently, the man whom Kerns and Harris work for, David Kelly (a longtime veteran of Klipsch), acquired the rights to the entire KLH lineup in 2017, and David Janszen has agreed to help him make the Model 9 a viable product again. The new KLH will not only comprise refurbished Model 9s, such as the one shown at CES, but also brand-new Model 9s, built from scratch. It is my intention to review one of these speakers in the near future. The Model 9 was always a supremely great transducer (much fuller-range than the great Quad 57) and, to my ear, it still is. The best sound at CES—indeed one of the best sounds I’ve heard at a trade show— undoubtedly came from the big, $191k, three-and-a-half-way (two 1" diamond tweeters, two 7" Omega 7 midrange drivers, and two 11" Nomex-Kevlar woofers in a D’Appolito configuration) Kharma Exquisite Midi Grand Signature floorstanders, driven by Lamm Industries’ ML3 Signature monoblock amps, LL1.1 Signature preamplifier, and LP1 Signature phonostage, sourced by a TechDAS Airforce 1 turntable (with SME 3012-R tonearm and Clearaudio and Ortofon Windfield Ti cartridges) and an Aqua La Diva transport and Formula xHD DAC, and wired by TchernovCable. Housed in a large room on the 35th floor, this sensational system was spacious like nothing else at the show—and gorgeous like nothing else at the show, producing a supremely beautiful sound wherein everything was in balance, everything was exquisitely defined (though not over-controlled), everything was imbued with lifelike bloom and color. Reproduction of vinyl was especially wonderful—phenomenally three-dimensional on JM's Decca recording of Libra and EMIs of Shubert lieder and various arias sung by Fritz Wunderlich, with fabulous spatiality, gorgeous tone color, and superb transients on voice and all instruments. This show was a high-water mark for Vladimir Lamm, who has been making some of the world’s best-sounding electronics since he introduced the ML2 twenty-five years ago, and for Charles van Oosterum, who has been making some of the world’s greatest loudspeakers for nearly as long. 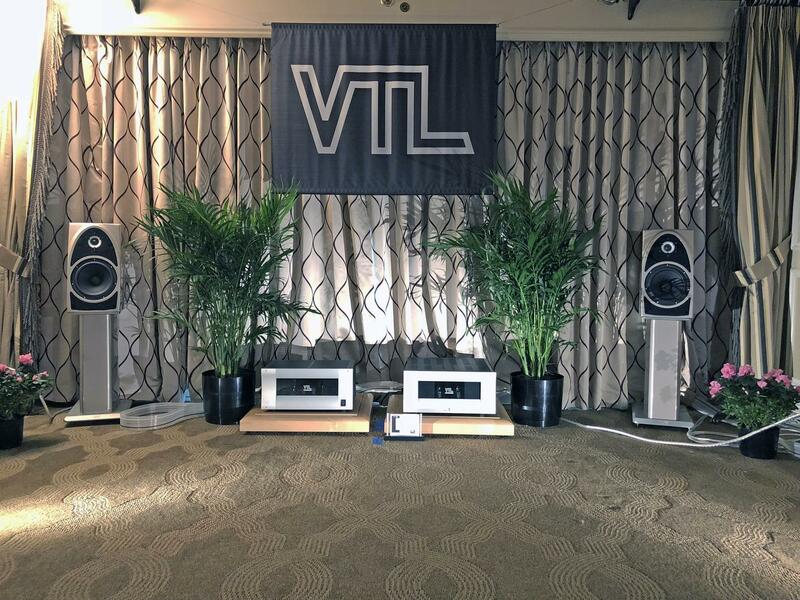 Both Vladimir and Charles have sounded marvelous, together and apart, at other shows, but this year’s system was flawless, showing off both speakers and electronics at their considerable best. My remarks about the demise of CES notwithstanding, it was worth coming to Vegas just to hear this system. The French company Amadeus was showing its gorgeous, $50k, powered (each driver has its own 700W amplifier), 64-bit DSP’d, pillar-mounted, two-way (one 28mm wave-guide-loaded soft-dome tweeter and one 230mm mid/woof in a cabinet comprising 547 different wood veneers) Philharmonia Home Edition. Because the “home edition” uses a shorter pillar, bringing the mid/woof closer to the floor, the bass is said to be slightly fuller and soundstaging somewhat deeper. Driven by a Lumin S1/A1 connected to a Japanese Fidata server, the Philharmonia, which lays claim to being one of the highest resolution loudspeakers in audio, was a bit warmer sounding than when last I heard it (in the non-Home Edition), but every bit as detailed, fast, and lifelike. I can remember being wowed by this speaker at its introduction in Munich two or three years ago, and at CES it wowed me again. The thing is not only super-resolved and super-transparent, it also has surprisingly deep bass, said to go down flat to 43Hz! Nonetheless, I would’ve liked to have heard the Beethoven Seventh with one of Amadeus’ matching subs—just to get a little more bottom-octave weight in the presentation. Subwoofed or not, this is one of the great two-ways, and since it’s plug-and-play, you just hook up a source (including an analog one—the Philharmonia Home Edition has an analog XLR input), and you’re ready to go. Across Las Vegas Blvd, in the Mirage, there were two more high-end exhibits, one of which was actually in my category. Wilson Audio was showing its $35k, three-way, four-driver (one 1" dome tweeter, one 7" midrange, two 8" woofers, each in its own ported, time-configurable enclosure) Sasha II W/P floorstander—the latest (and to my ear, greatest) of the many iterations of the classic WATT/Puppy. Driven by Dan D’Agostino’s Progression Stereo amplifier and Preamp, sourced by a dCS Vivaldi, and wired with Transparent cable, the Sasha II W/P sounded, well, terrific and terrifically musical on everything that was played. My compliments and very best wishes to David Wilson, Sheryl Wilson, Daryl Wilson, and, of course, Dan D’Agostino. 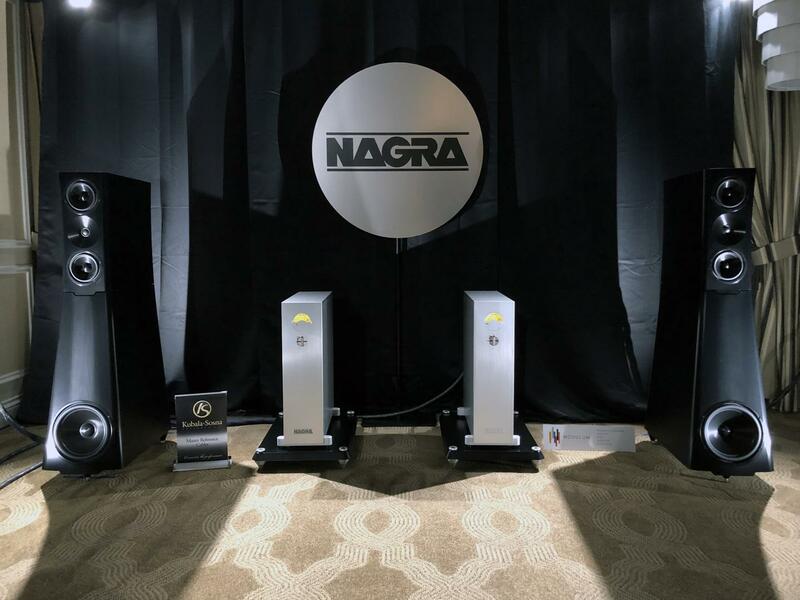 I’ve had mixed reactions to Magico’s $28k, three-way, four driver (one 1" diamond-coated beryllium tweeter, one 6" nanographene midrange, and two 9" nanographene woofers in an oval aluminum enclosure) S3 MkII floorstanders—sometimes I’ve loved them and sometimes I haven’t, depending on room and ancillaries. This year, driven by Constellation’s new Revelation Series Taurus amplifier and Pictor preamplifier, sourced by Constellation’s Cygnus DAC, wired with MIT, and seated on Critical Mass Systems stands, this all-digital (alas) system sounded quite beguilingly lovely. On Shawn Colvin’s killer cover of “Viva Las Vegas” (the song that’s played over the end titles of The Big Lebowski), the Magicos were warm, sweet, and lifelike on voice. Ditto on Keb’ Mo’s “Am I Wrong.” The S3 MkIIs might not have been the last word in detail in this setup and the bottom octave was a little soft, but on the RR recording of Rachmaninoff’s Symphonic Dances, the power range was as solid as a rock, dynamics were excellent, staging was huge, and string and wind tone were lovely, albeit a bit darkish. All in all, an excellent showing and an excellent small three-way. 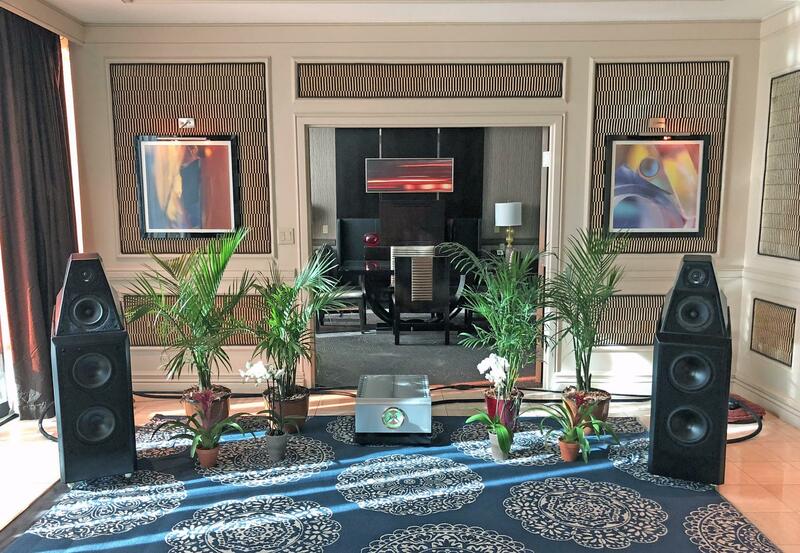 Though technically not in my category, the $14.6k, time-and-phase aligned, four-way, five-driver (one 1" tweeter, one 4.5" midrange, one 6.5" mid/woofer, and two 8" subwoofers) Vandersteen Quatro Wood CT floorstanders sounded their usual fabulous driven by Vandersteen’s M5-HPA amplifier. Richard Vandersteen and Vandersteen Audio are to dynamic loudspeakers what Wendell Diller, Mark Winey, and Magnepan are to planar speakers—creators of many of the best buys in high-end audio. 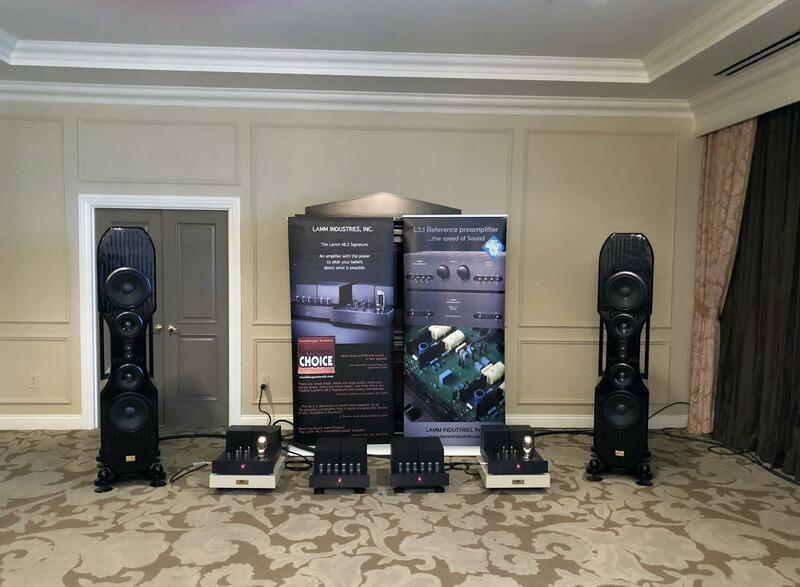 Raidho’s $120k D 4.1 ribbon/cone hybrid floorstanders—speakers I’ve loved in the past when driven by Aavik electronics and wired with Ansuz cable—were more of a mixed bag driven by top-line Chord electronics and wired with Nordost cable. They seemed to lack their customary fullness in the power range and voluptuous “bottom-up” sonic signature, which made them both more neutral and less rich and exciting. Genesis Advanced Technologies showed its $30k ribbon/cone Maestro floorstanders, driven by Viola electronics. Despite some room boom, they were dark and pleasant on an Anne Bisson direct-to-disc LP. Eggleston Works’ multiway Andra Viginti LE floorstanders, driven by SAE amps (another marque from the past reborn! ), were dark and solid on Madeleine Peyroux’s “Don’t Wait Too Long,” with punchy, slightly overblown bass (with what sounded like a big port boost), excellent power range response (hence the solidity of the sound), and natural mids. Best Sound of Show (Cost No Object): Vladimir Lamm and Charles van Oosterum’s fabulous Lamm/Kharma system—not just the best of CES 2018 but one for the ages. Best Sound (For the Money): In my category of speakers $20k and up, that would have to be the reborn KLH Model 9, driven by Rogers Sound integrated amps and an Oppo disc player—perhaps the most completely natural sound at CES. Most Significant Trend: Well, I could say the abundance of analog gear (including Nagra’s fabulous reel-to-reel tape player), but the most obvious and significant trend is, of course, the decline and fall of high-end audio at CES. CES High End been heading for disaster for years and, now, disaster has arrived. It didn’t have to be this way—a lower-priced venue, more reasonable drayage, aggressive publicity à la Munich High End, more attention paid by CTA. But the truth is that high-end audio has never been a priority at CES, because it’s never been the moneymaker that, oh, cell phones and computers are. I’ll keep my fingers crossed for a rebound (there were, as I’ve noted, some positives in attendance and business done), but it's gonna take a village effort to bring CES High End back. Most Coveted Products: A tie between the “new” KLH Model 9, the Kharma Exquisite Midi Grand Signature, the new Technics SL-1000R turntable (I used a Panasonic SP-10—Panasonic is Technics' parent company—for almost a decade), the new VTL 2.5i phonostage, the new D’Agostino Progression electronics, Audio Technica’s novel AT-ART1000 mc, and (if only) Nagra’s reel-to-reel tape player and a choice selection of René LaFlamme’s fabulous mastertapes!